Local Field Potential (LFP) is simulated by adding the neuronal membrane potential of a group of model neurons surrounding a typical intra-operative micro-electrode used to localize the target for deep brain stimulation (DBS) in Essential Tremor (ET). Each neuronal membrane potential is modeled as an Ornstein Uhlenbeck Process (OUP) and the model parameters are extracted from real neuronal recording during DBS surgery following the method in . Where, x is the membrane potential of each neuron and r is the distance from the recording tip. The simulated signal, lfp is then low pass filtered (1-40 Hz) to produce the final signal. Where, l(r) is the stimulation intensity at distance r from the recording tip and follows a similar inverse square decay as in (1), τ is the membrane time constant (an OUP model parameter) and S is the neuronal firing threshold. 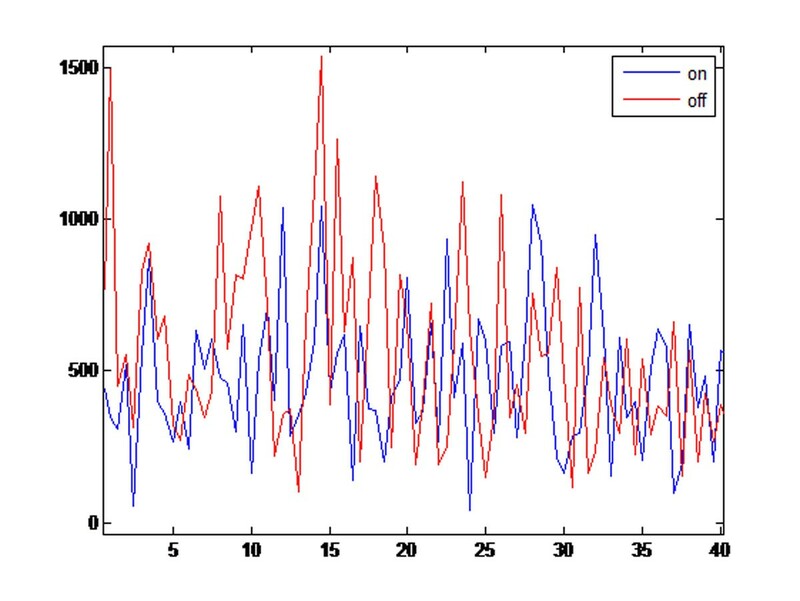 Thus the LFP simulated during stimulation depends on the stimulation intensity, pulse width and frequency. It was found that the power in the (5-12) Hz band decreases by 26.4% during stimulation. There is increased synchronization in neuronal activity of the thalamus in the theta band (4-7 Hz) for patients with ET . The suppression of tremor by DBS is reflected in the reduction of power in the tremor frequency band. Such a model , can potentially be used to find an optimal set of stimulation parameters that will produce the maximum suppression in the tremor power. Spectrum of LFP before stimulation (in red) and during stimulation (in blue).